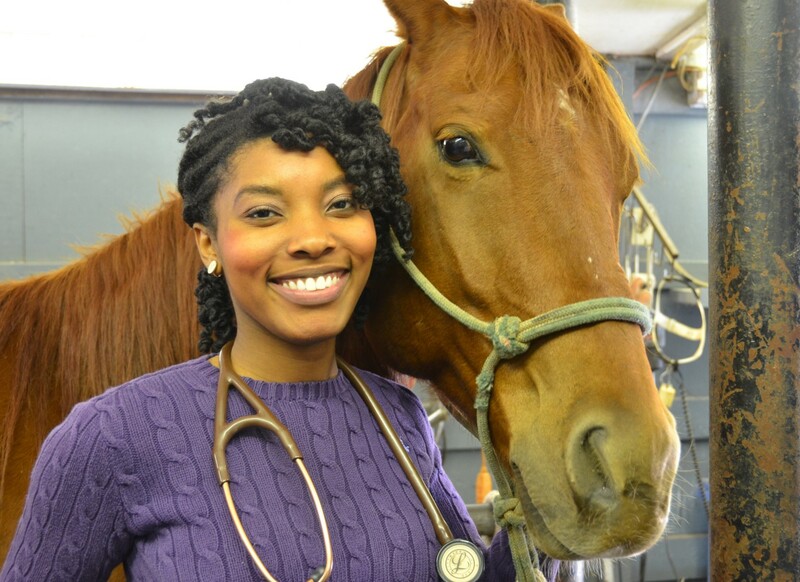 A graduate of Cornell’s Veterinary School of Medicine, Dr. Aziza Glass is inspiring thousands with her booming career as a veterinarian. Dr.Glass is regularly featured on panel discussions to share her knowledge of animals. Additionally, Dr. Glass was featured on Nat Geo Wild’s series Vet School. Habiba Abudu (HA) : Where does your passion for animals come from ? Dr. Aziza Glass (AG) : Growing up, I watched many animal documentaries. My dad further cultivated my love of animals by checking out DVDs from the library, buying animal encyclopedias, and helping me create animal behavior experiments in our own front yard. It was inevitable that I would have a career that involves animals. HA : When did know that you wanted to be a veterinarian and what did that process entail ? AG : When I was a sophomore at Prairie View A&M University, I knew I wanted to eventually obtain a doctorate. However, I wasn’t sure what field would be my focus. I heard the graduating seniors talk about applying to veterinary (vet) school. It dawned on me that I could do that too. I always knew what a veterinarian was, but prior to that, I had never considered being one. I had no pets growing up, and I didn’t live in a rural area with farm animals. The first time I met a veterinarian was in college. Then, I found out one of my professors who I had always referred to as “Dr.” was in fact a veterinarian. Once I decided that Veterinary Medicine was a field that I was interested in pursuing, I interned for about a year with a veterinarian who had a mixed animal practice. I completed the internship while going to school and working. One of the university’s administrators helped me put together my application for veterinary school. Finally, I applied and was accepted. It was a win for everyone who had invested their time and effort into me. HA : How was vet school ? As well as being in Nat Geo Wild’s Vet School ? AG : Vet school was one of the hardest and most rewarding endeavours I have ever embarked on. I was excited about vet school because I was going to be learning about animals, and my colleagues would be infatuated with animals too. Vet school is a rigorous process where you learn about anatomy, chemistry, ethics, and several species all at once. Each year of vet school brings additional information and challenges. You need stamina, a great support system, and a prayer life. It’s a marathon, not a sprint. Being on Vet School was surreal because I grew up watching shows about animals. I knew that Vet School would provide me with a platform that I shouldn’t be taken for granted. I always remained conscious about how I represented the network, Cornell University, the College of Veterinary Medicine, my family and my community. It’s not every day you see a black woman with natural hair talking about life as a professional-in-training without fights, curse words, and more. The most rewarding thing about Vet School has been all the emails, comments, and DM’s from women of color telling me how I have inspired them or their children. HA : It’s inspiring to see a person of color rock their natural hair. As a veterinarian, did you ever feel insecure with showing your natural hair in the office ? AG : Once I went natural, I knew that I wasn’t going to hide my hair. I never felt insecure wearing my natural hair at work. It was empowering to rock my natural curls while attending vet school, filming Vet School, and now as a veterinarian. Every now and then, I notice a client curiously looking at my ‘fro. Clients mostly compliment me on my different hairstyles. Either way, my ability as a veterinarian does not decrease because of my hair. HA : How does your faith inspire you career/life ? AG : Veterinary medicine is an honorable profession, but it is definitely not a walk in the park (for someone who looks like me). It is a field where the suicide rate is twice that of the dental and medical profession. It has held the title of the whitest profession in America for several decades. Even though women make up a significant majority, there is still a gender pay gap. I must have an active prayer life. Prayer helps to bring peace, joy, and understanding. This is invaluable in a field like veterinary medicine. My faith keeps me focused and grounded in my life and career. I have overcome many obstacles because of prayer and my faith. I recognize my blessings and know that each victory has only been made possible by God. HA : Finally, what advice would you give to those with big dreams ? AG : Never let anyone discourage you from achieving your dream. They will tell you that you’re not smart enough, pretty enough, or even wealthy enough to do what you want to do. Most of the time, the loudest critics are the ones who tried to do something similar and failed. In their minds, if they couldn’t do it, it’s not possible that you can. This mindset should not dictate your drive towards your dream. In fact, you should use it as your motivation.